grow and bloom forever more! Can you find the “Hidden” Mickey in this photo? I’ve sort of helped to “point” you in the right direction! 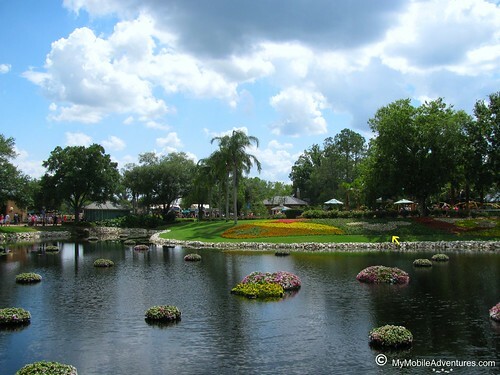 Nobody does landscaping like Disney! Cute post and I love the photo..
Hello Tink! Thanks for pointing Mickey out..
Shh! Dora! Is that an arrow? Really? Are you sure? It’s a good thing you pointed as I was not even looking in the shade. Thanks for sharing. Happy Outdoor Wednesday. such a gorgeous day and lovely garden! M I C K E Y….yeppers I do see him. Lovely post. ta ta for now. What amazing clarity in your photo. I can see him! This is a lovely spot. Wonderful photo – Thanks for sharing.